With 48 games left to play, the San Francisco Giants hold a one game lead over the nemesis in the NL West and have returned home to the confines of AT&T nee´ Pac-Bell Park for a much needed ten game home stand. Hunter Pence came home with a black eye. Buster Posey’s face was all busted up. We lost a 1-0 CG by Bumgarner and we pounced on and beat Strasbourg. Brandon Crawford had a seven-hit game! We won a 1-0 game for Samardzija. It was a crazy trip. But now we are home and we’re up a game and there are four dozen left to play. Here at Giants Baseball Corner we changed the avatar of the Twitter account to the one we have used for the stretch run since 2012, our photo of the dugout sign that was featured in the Emmy-award winning Episode 7 of SFG Productions Orange October. I only have one wish left and that’s to see Bruce Bochy vs. Joe Maddon in the NLCS. But I must be patient, be filled with fear and hope. I must focus on today. Win today. Brisbee posted a really nice analysis of the way we swing the bat. What we hit, what we miss and how. I encourage you to read it ’cause there are silver linings galore. Brandon Crawford had SEVEN HITS in a game! It was insane. He went 7 for 8! His batting average increased by 13 points in one night. It was boss. Doing what they do best, which is archiving, CSNBA and AlPav did a really cool bit covering two men to have seven hits in a game. While in Miami, they found the previous and they got them together. Was awesome. Berman even wrote about Crawford’s wonder. Baggs has a nice piece on a turning point for the bullpen. Stricky looking better, with more pitches and some command. Casilla coming back with a vengeance from the humiliation of the balk. Derek Law putting up numbers. 48 to play. Let’s get this done. We’re playing in New York City against the Yankees this week, and immediately my thoughts turn to Willie McCovey whose line drive that could have won the first World Series in San Francisco was caught by Bobby Richardson in Game 7, beginning a 27-year World Series appearance drought for the G-men. Many long time fans associate the Game Seven loss with intense feelings not only because of the drought that followed, but because the drought implied we couldn’t win it all in San Francisco. The implication that we were somehow cursed not to win in SF grew for another 26 years and it’s the basis for the intense feeling of relief we all felt when at last we won in 2010. The history of the ’62 Series fascinates decades later because of the incredible talent on both sides, but among fans I have interviewed about it, there lingers a feeling that the Giants let this one get away. So many of us ache for Willie McCovey. “This World Series, which was closely matched in every game, is remembered for its then-record length of 13 days, caused by rain in both cities, and its appropriately dramatic conclusion. The Yankees took the Series in seven games for the 20th championship in team history. The Yankees had won their first World Series in 1923; of the 40 Series played between 1923 and 1962, the Yankees won half. Wrote this ten days ago but didn’t have internet access to upload it. I owe Jake Peavy an apology. Jake, on your 35th birthday you were a badass. I don’t know anyone who can say they dominated a Major League Baseball team from the mound and, being that it’s the NL, scored the winning run on their 35th birthday. That was awesome. An aside: on my 35th birthday, my girl was three months pregnant with our son. I was shuttling back and forth between SF and LA working on projects. My girl was working for a major magazine down in LA. We were Giants fans in LA the year we we’d go to the WS and lose to the Angels. T’was rough. As a former BoSox pitcher you must have seen the type of fan I am before … pining for years for victory, way too focused on irrelevant details. Quick to anger and panicky. Man, I am dumb. That now 13-year-old boy and I got to see you pitch live for the first time this year, on Opening Day at the Yard. It was a rough start for you and in the subsequent weeks, I was critical of your performance and said some things I shouldn’t have. I apologize. Sometimes, I’m the worst kind of fan – the one who vests too much into things that don’t matter, driven by my anxety and love for the team’s success. Your game yesterday and the start before it put me in my place. I appreciate what all you have done for this team. The great starts are great and I will try harder to understand how difficult the game must be during the poor ones. Well done, Jake, Happy Birthday. Thanks for your efforts and let’s get Johnny a second ring! Giants got a couple back against the Marlins, but the last one we should have won … and let get away. Josh Osich may just need a second after the week he had. Consecutive beanings of the same DBacks player the second of which led to a bench-clearing, followed by giving up the dinger that cost us the last game. Ouch. John Shea has an excellent piece on early returns from the experiment of using the Starting Pitcher in the 8-spot (which we of course love so much here at GBC). It’s too early to say anything definitive, but I LOVE that Bochy is committed to a serious sample size. This early data will be immensely useful down the road. Brisbee has data about the infield shift and how the G-men aren’t doing it as much that is pretty interesting. And with Barry Lamar back in town with the Marlins, Gutierrez at ESPN wrote about it, thusly, but I really loved this moment: Bonds seems so relieved of bad and idiotic and rude and hateful press. It is nice to see him laugh … and to hear him brag about himself again! It is easy to forget the lone victory in our three games in Colorado, but it is important not to do so. Jeff Samardzija looked as good as he has yet looked in a Giants uniform and the Giants took Game One of this series 7-2, behind a stellar performance by The Shark. Samardzija went seven strong innings, gave up just two runs and six hits, striking out four. He had two walks, but managed the game well and was in control of a tough Rockies lineup throughout. The Giants continued their Home Run hit streak throughout the series and rookie C Trevor Brown had two in that first game, bringing his total to three for the year – his first three hits in the majors are all home runs! Hunter Pence added another two-out, two-run homer in support and the Giants were looking good. Jake Peavy is going to be a problem unless he can right himself quickly. His opening day start at the yard in which he put us in a 0-5 hole in the first four innings, was calamitous and in Colorado his second start was worse. He was shellacked by the Rockies early and often. Jake Peavy gave up a NY/SF Giants franchise-high 10 Extra Base Hits in this one – the most allowed by a pitcher since Curt Schilling gave up 10 for Boston on Aug. 10, 2006, against Kansas City. It was seriously ugly. Arenado homered twice, Peavy was a total meltdown. The Rockies ended the day with 12 XBH and a blowout, defeating the Giants 10-6. Brandon Belt did homer in this one to keep the Giants Home Run streak alive at nine games. Matt Cain came into the rubber match as a question mark, as usual. Which Matt Cain would we see? Well, for four innings the answer was AWESOME MATT CAIN. Cain was precise, throwing 92- and 93-mph fast balls to great success. It was a thing of beauty long-forgotten since we hadn’t seen him this sharp in a while. It was pretty exciting for a few innings there. Then all of a sudden in the fifth, Cain gave up a dinger, then a double and then found himself in a chippy battle with Craig Wolters, who finally just barely got the best of Matty with a bloop flare over the head of Matt Duffy. 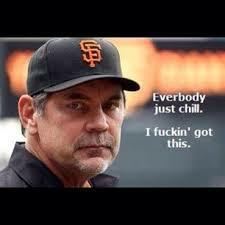 That was the beginning of a collapse that ended in embarrassment as the Giants gave up 9 runs in the 5th inning. In this one, Matty had struck out Arenado twice and was to face him in the fifth with the bases loaded, but Boch decided Matt was done after a 35+pitch inning that had him on the hook for those three base-runners. He brought in Chris Heston who was pitching on consecutive days for the first time in his young career. Hesto gave up a double to Arenado and the run-parade began. Meanwhile, Jorge de La Rosa pitched a great game and managed the Giants bats well. This was a tough loss. Belt managed to homer again though – a bright spot is our ten game homer streak. But at the end of the day, the Giants gave up 31 hits in the last two games to these Rockies at altitude, prompting a lot of fans on twitter to express their hatred for Coors Field once again. Some injury news, Romo is out temporarily with an elbow thing. Brandon Crawford had to leave with a flexor flare, and Posey who was held out a couple of games to help heal his toe, came back and caught well for Cain during his comeback 4 innings. Glad to be out of Colorado and on to face the Nemesis in Chavez Ravine with MadBum v. Kershaw II tonight at 7:10pm. In case you haven’t been paying attention to baseball yet because you’re wrapped up in Warriors or Sharks or The Masters coverage, our San Francisco Giants are looking really good at the plate. Yes, that’s right, THE GIANTS ARE HITTING! We had 36 hits over the series and with 14 home runs we stand second behind the altitude-assisted Colorado Rockies (17) in homers. With 64 hits, we stand second behind the Nemesis (76) in hits (they had a breakout opening weekend at the plate). Those stats are for the MAJORS, both leagues – we are second in hits and homers in all of baseball. But first things first, from Opening Day at AT&T park here’s GBC’s footage of Your 2016 San Francisco Giants lineup. The home opening weekend series against the Nemesis was just about perfect (except for George Kontos and a few other reasons we couldn’t hold on to Game 3 to sweep – Brisbee has those here). While pitching is taking a little while to get on track, our lineup is covering for the starters. The three wins were all come-from-behind victories and once the hits and runs start, with these guys, they seem to pour out. It’s infectious, situational contact hitting – bunts, singles, doubles, sacs and homers on the regs from Span, Duffy, Panik, BCraw, Pence and Posey surrounded Trevor Brown’s first major-league homer over the weekend. Move ’em along and hit ’em out seems to be the philosophy of this group and it is pretty thrilling stuff. Many have remarked – and it doesn’t take long to notice if you watch the Giants – that there’s really no weakness in the lineup – everybody is a threat to do something with the bat. We are bunting and moving ’em over and sacrificing and getting ’em over and hitting balls out of the park with startling regularity. Most importantly, the hitting has been timely. and of course, at last, we are batting the pitcher in the 8-spot AND IT IS WORKING. Angel Pagan seems to be healthy at last and looks way better than last year. Pagan is showing the form he had in the Championship seasons. With pitchers who rake, like MadBum and Peavy, and with Pagan in the 9 and Span at the top of the order, the Giants are turning what used to be dead innings into run-producing opportunities. A sweep would have been truly perfect, but Madison Bumgarner’s second homer off Kershaw in the lone loss made it palatable, and honestly, with the Division lead and the way we are hitting, I couldn’t be happier. Andrew Baggarly has a nice longform piece here wherein he talks closely with Posey about his relationship with the new pitchers and with Samrdzija about his approach. Posey is such a valuable member of the San Francisco Giants – here Baggs has him actually sitting down and watching film with Cueto and Samardzija, functioning like an on-field player-coach. We are so blessed to have MVPosey. Chris Haft has an up-to-date piece on who might make the Giants bench and remarks that versatility is going to be in high demand. Brisbee on the value of the SF Giants being Two and a Quarter Billion Dollars. BASEBALL SEASON IS JUST A WEEK AWAY!!!!!!!!! Hey everyone, excited for the season and I’m going to try a new type of post this year that I’m calling The GBC Reader, which I hope will serve as a link archive of current stories and topics of interest, because I feel like there’s a TON of coverage already of our Giants that’s a little redundant. Johnny Cueto on the first pitch of a night game against Oakland, got drilled in the forehead, which was pretty scary, but he got up and was all right. He stayed in the game and was diagnosed with a contusion, but not a concussion … here is a comprehensive piece by Haft on the matter. Here’s Steve Berman’s current projection of the Opening Day Lineup, which speaks to the strength of play by Gorkys Hernandez this Spring and other interesting tidbits. Brisbee, predicting a lot of playing time for Chris Heston has some in-depth on the young hurler who became the first Giant rookie to throw a no-hitter (vs. the Mets last year). At age 51 and as batting coach for Miami, Barry Bonds aka The Greatest Power Hitter to Ever Swing a Baseball Bat, defeated a bunch of Marlins – including Giancarlo Stanton – in a HR hitting contest. Brisbee, of course, gushed, but I really like the video clip at the top of this piece on CSNBayArea in which Barry speaks frankly about how he knows he is a Hall of Famer and the fraternity of people, like me and everyone here at GBC, who know it, too. Love you, Barry Lamar. All righty, that’s GBC Reader No. 1, for ya then … don’t all rush to read it at once. Since we are back up and running it’s probably a good idea to drop a post every day or two to keep us all connected. The Giants won game one out in Scottsdale by the score of 4-1 over the Angels. Samardzija started and Posey played and Tomlinson and Lollis and Arroyo all looked good. I’m not going to write a lot because, honestly, every single second is being chronicled in triplicate by Schulman, Pavlovic and Baggs, and analyzed ad nauseum by the clowns at Comcast and KNBR, so it’s unnecessary to repeat what everyone already knows. Here is a link to Haft’s Nice Wrap of our first Spring Training Game though. Excited for the season. I have concerns about Angel Pagan and it looks like we will get to see him play today – and Matt Duffy, whom Jake Peavy called his favorite Giant in a twitter chat hosted by the Giants earlier this morning. It was pretty cool to hear the likely Opening Day Starter’s thoughts on all kinds of things. I am looking forward to seeing him pitch in Game One at the yard on April 7th. Thank you @kimberlybhudson and family of Huddy Thank you Huddy. Thank you Yusmeiro Petit! Seriously! Thank you SIR Bam-Bam Muelens.